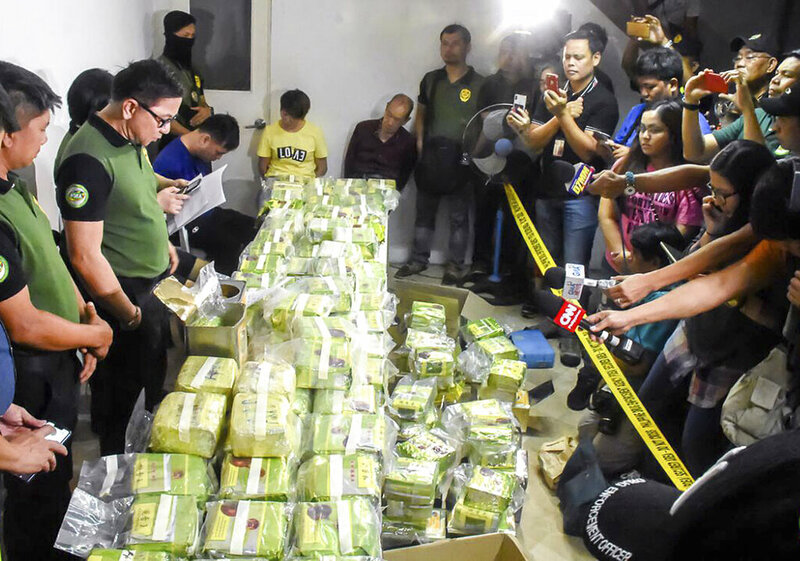 Manila, Philippines (AP) — Philippine authorities said Wednesday that they have seized methamphetamine concealed in tea wrappers and biscuit cans in their second-largest drug haul this year in a sign of how the problem has persisted despite the president’s bloody anti-drug crackdown. Three Chinese nationals and a Chinese-Filipino interpreter were arrested late Tuesday in “buy-bust” raids in an upscale residential enclave and outside a shopping mall in Alabang village in the Manila metropolis, said Philippine Drug Enforcement Agency chief Aaron Aquino. Aquino has called for the return of the death penalty in the Philippines for drug traffickers, better security along the archipelago’s extensive coastlines and more extensive databases of foreign drug suspects for the immigration bureau to deter drug trafficking. Corruption also fosters the drug menace, he said. “There are those who have been detained for drug offenses, for example, in China but they could still enter our country. We have arrested many of those identified foreign offenders here,” Aquino told The Associated Press by telephone. Aquino has also sought legislation to make it easier to criminally charge owners of plush residences, condominium units and buildings, where he said drug traffickers have shifted their bases from more public areas and rural warehouses that have been raided by law enforcers. Tuesday’s drug raid targeted a house that the Chinese suspects rented in posh part of Alabang village where prominent lawmakers, politicians and business executives live under tighter security. Duterte’s move to withdraw the Philippines from the tribunal supposedly took effect on Sunday, but its prosecutor said she would continue examining the complaints.